The name says it all! The Coast 2 Coast tour lets you experience everything Sri Lanka offers. Explore an ancient citadel built into a mountain. Discover an island hideaway teeming with turtles and corals. Immerse yourself in the culture visiting sacred temples. Trek the tea trails of the scenic hill country. 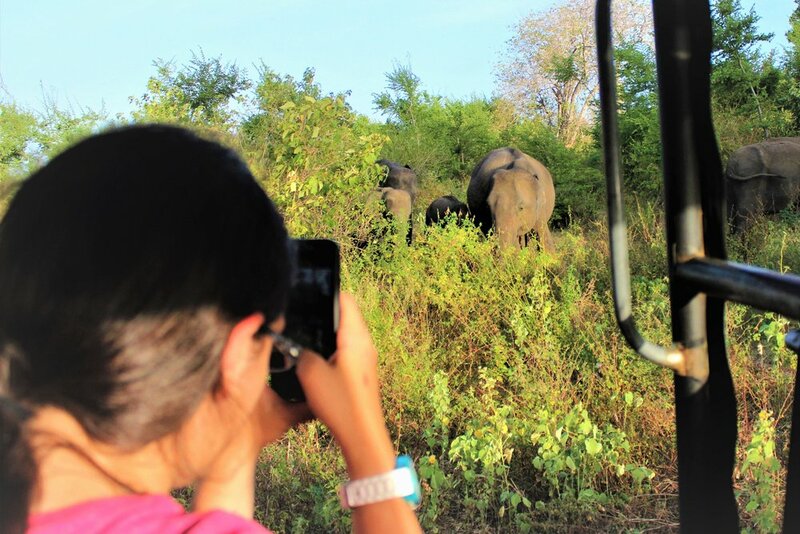 Observe elephants on a safari in a national park. 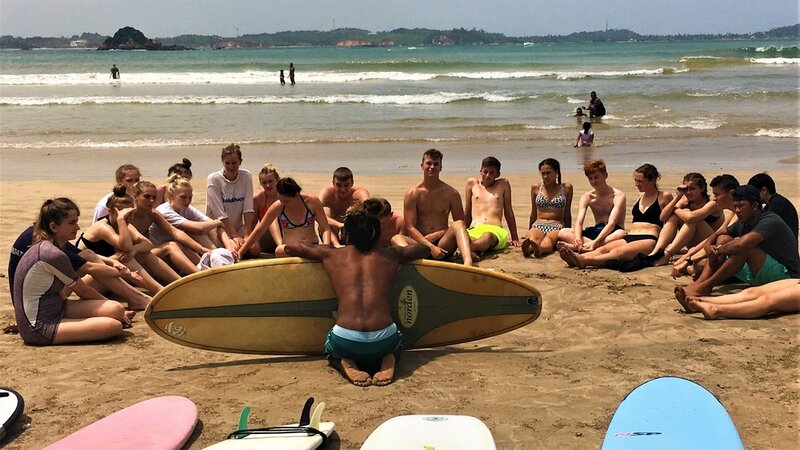 Learn to ride waves in our surf camp. The experiences are truly endless. Embrace every moment and make memories and friends that will last a life time! 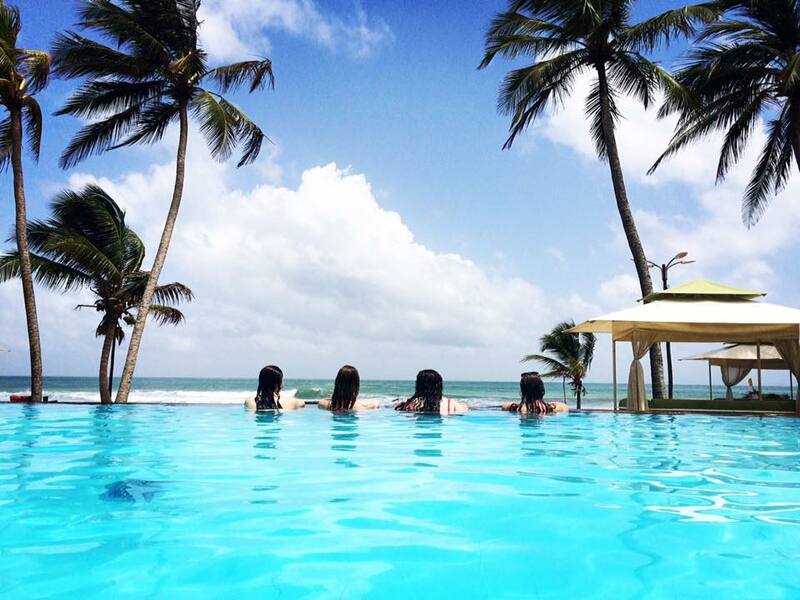 We will put you in a group with like-minded travellers. The Travelteer bus (Yes! We have our own bus) can carry up to 22 people on each tour! 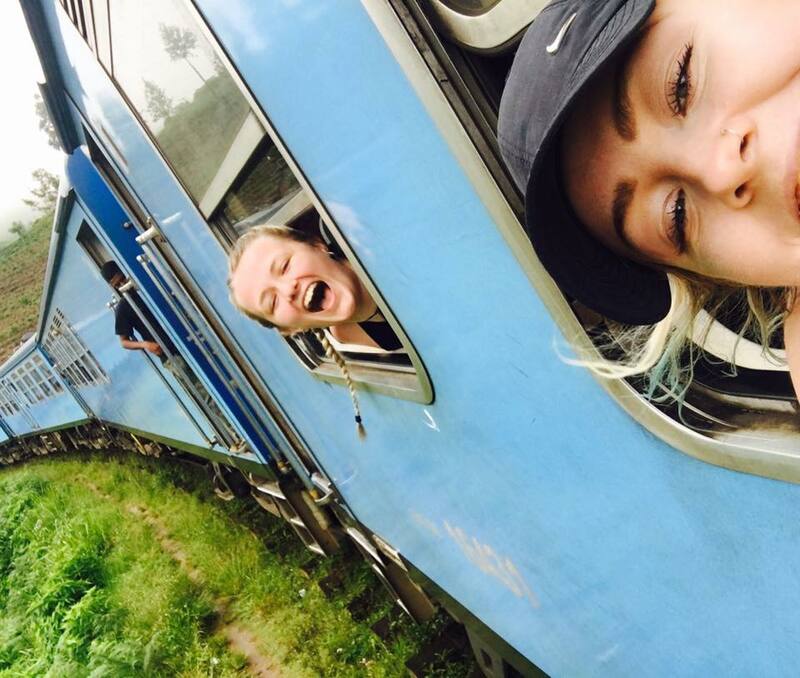 Our bus is air conditioned and we like to think it’s top of the range when it comes to transport in Sri Lanka. This will be your abode whilst on the road and will take you to each destination. 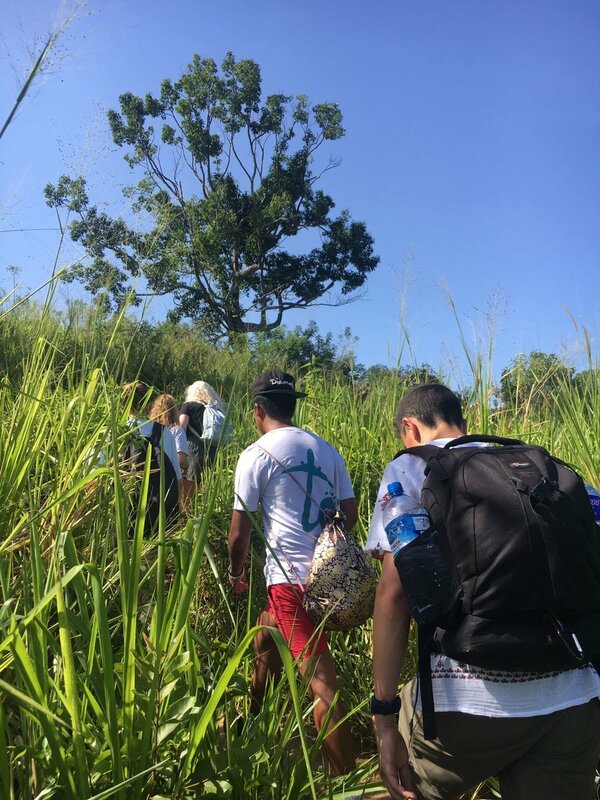 You will be guided throughout the whole of your adventure by our tour assistant, Kalum. He will be with you every step of the way making sure you don’t miss anything and more importantly, you get back in one piece! On arrival you will be taken to the resort town of Negombo. Here, you will meet your fellow travellers and we will conduct an induction session in the evening. Perfect place to rest up and go for a swim, so you’re ready for the tour! The tour begins! 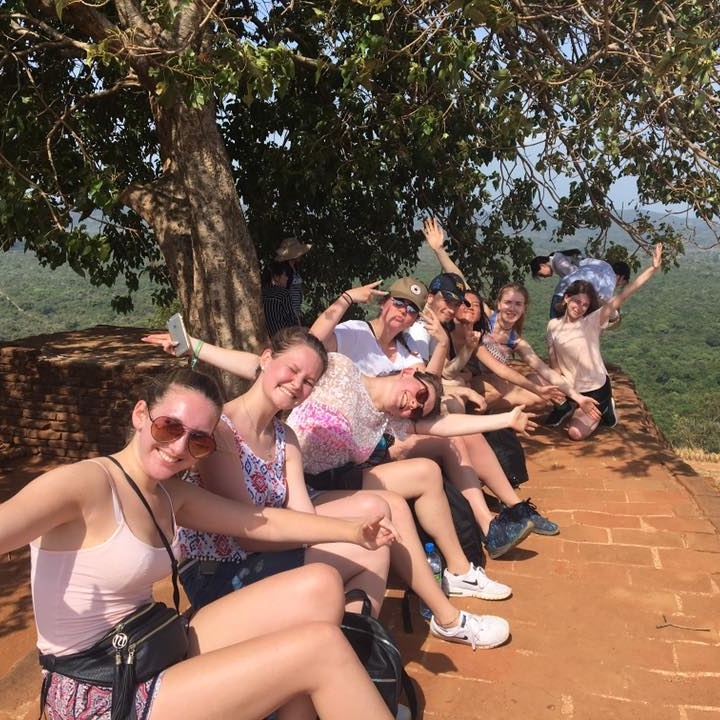 First stop is to the Ancient Fortress of Sigiriya. This massive rock is considered the 8th wonder of the world! You will climb countless stairs and walkways that will eventually lead you to the palace which sits on the plateau 370 meters above sea level. But it’s all worthwhile the view is epic! Just in time for sunset you will arrive in the quaint backpacker’s village of Upperveli. After some grub and a good shower, we head down to the beach for a bonfire. If you are lucky, there will be bio-luminescent plankton that light up the sea in a fluorescent blue! Ohh and the stars at night are incredible. In the morning you’re heading up to the pristine beaches of Nilaveli where you will take a speed boat across to Pigeon Island. This island is a protected park requiring visitors to gain a permit (we have that all sorted!) 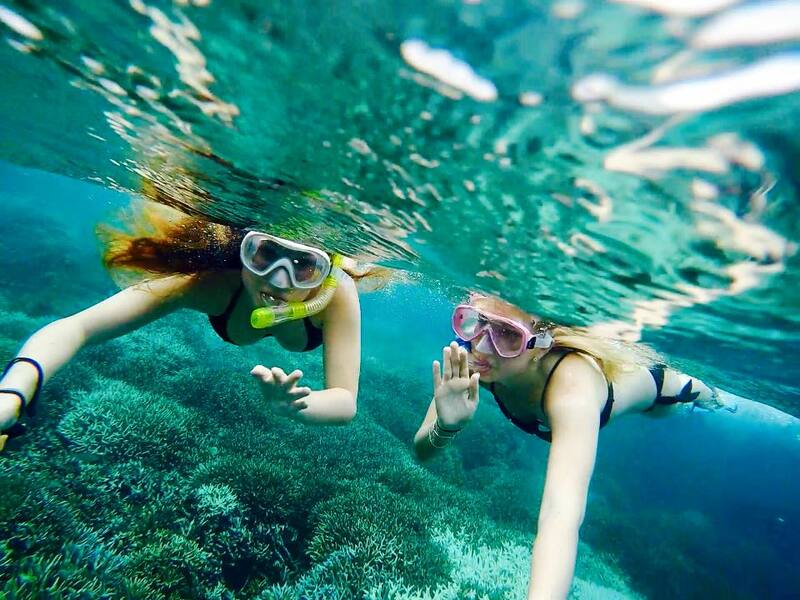 making it the best kept coral reef in the whole Sri Lanka. 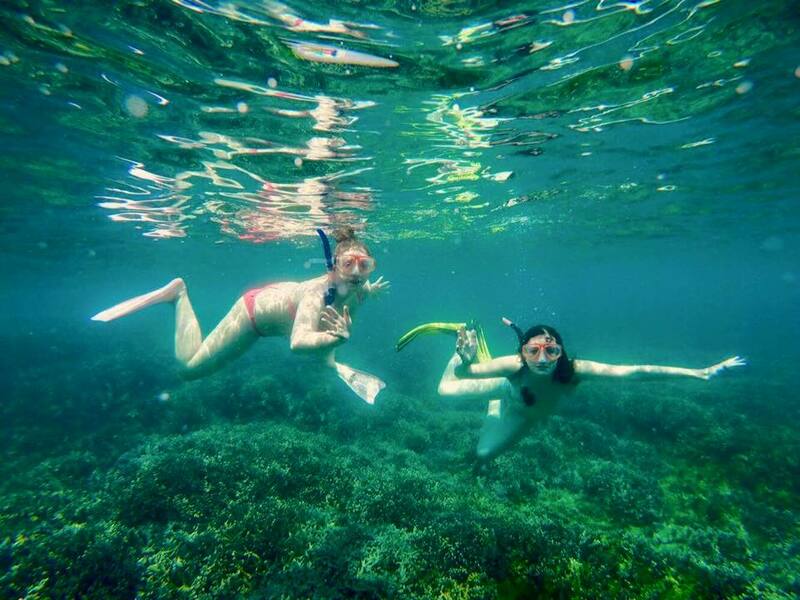 Possibility to see a diverse range of tropical fish and ohh yeah.. black tip reef sharks (don’t worry their harmless)! After a day at this paradise island it’s now time to head back to the village for sunset volley ball and a beach BBQ. So, it’s time to hit the road again! Now, you are on the way to Sri Lanka’s city of culture, Kandy. This ancient capital is has millennia’s of history and is home to the Buddha’s tooth! 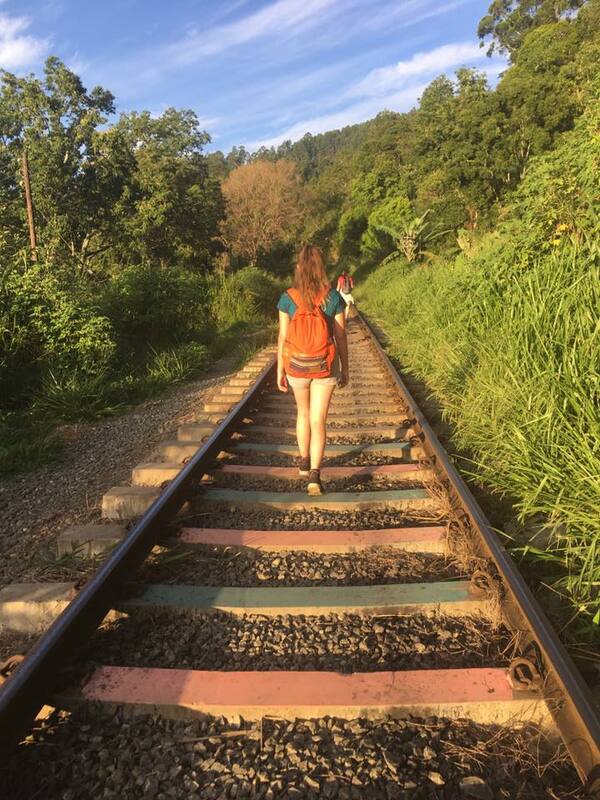 You will first head into the heart of Kandy where you will be dazzled by the markets. Then it’s off to the culture show where you will watch traditional Singhalese dancing and fire walking! As the sun goes down, we head to the temple of the tooth. Retreating back to your hostel (which boast’s the best views in the city) a balcony party awaits! 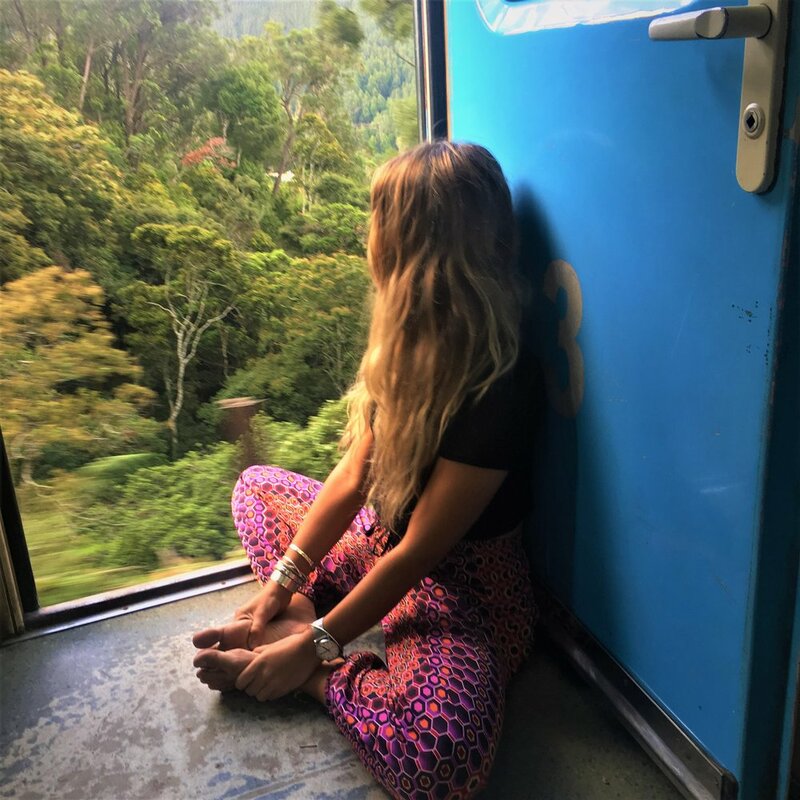 As the sun rises it’s off to Nuwara Eliya once called ‘Little England.’ Here you will visit a tea factory before experiencing an epic train journey through the heart of the hill country. Arriving in Ella, it’s time to swim underneath some waterfalls! After a quick rest, put on your walking shoes as your heading on a trek up Ella rock. Here the best view of Sri Lanka awaits! Ok, now it’s what you have been waiting for, the safari! 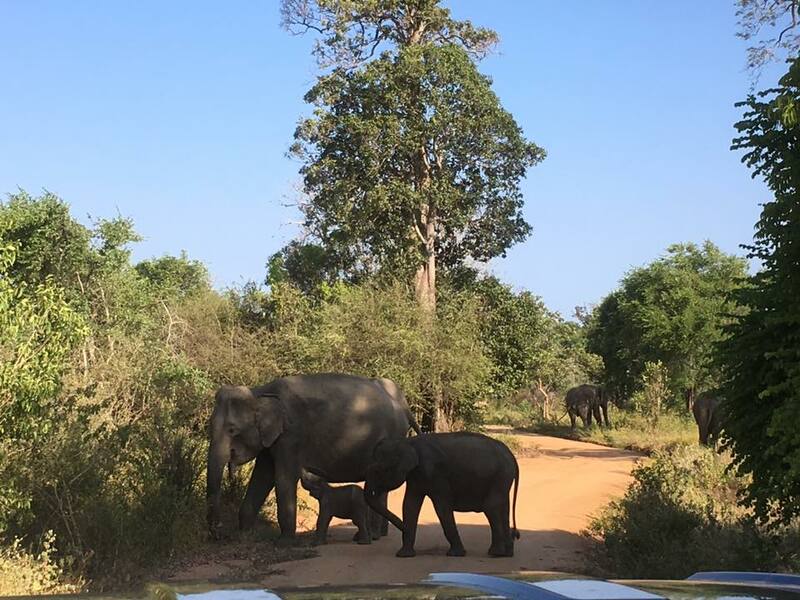 Leaving the foot hills of Ella you will enter the savannah of Udawalawe national park. Here, you will see countless number of elephants and other big wildlife around the various water holes. 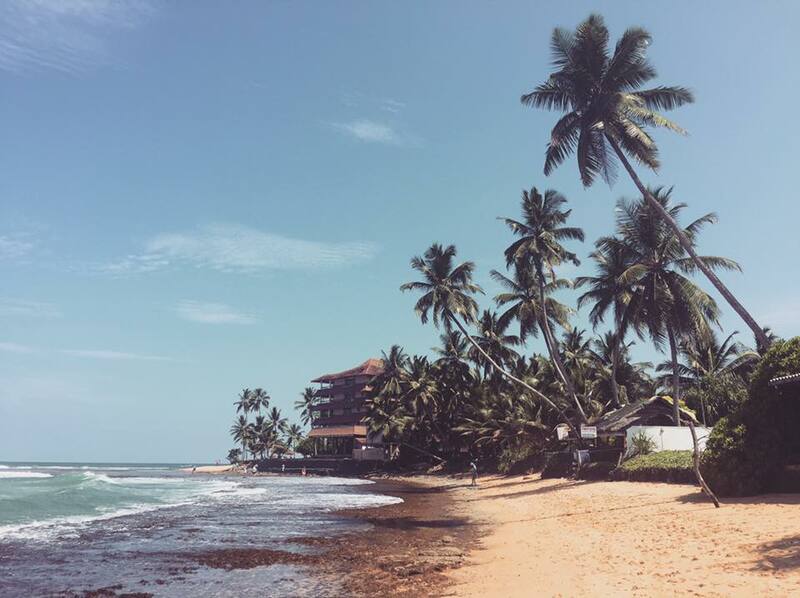 Once the safari comes to an end it’s off to the coconut beaches of Mirissa. Time to soak up those rays! Late morning we are off surfing at Weligama bay. This bay is regarded as one of the best places to learn in the world! 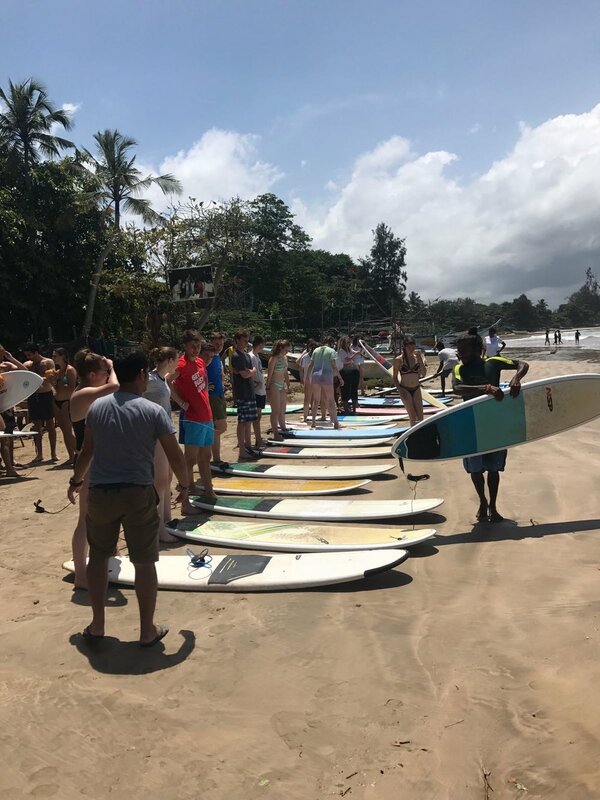 With shallow, sandy waters and metre high waves this place is perfect for beginners. Don’t worry if you are a seasoned surfer, we can take you around the corner to a surf point. Watch out for the reef though! As sun starts to set, it’s time to let your hair down for a sunset beach party! Now the tour is drawing to an end, but there are still a couple of surprises that await. First it’s off to Galle fort built by the Dutch in the 16th Century, now home to various shops and café’s. Sadly the tour ends here, but it’s time to meet your fellow volunteers and get involved! All our accommodation has been personally selected and tested by Travelteer! All accommodation has western style toilets and showering facilities but varies depending on the location. In more remote places, there is only cold-water showers but where its cooler there is hot water! The rooms vary in size (from 2 people up to a 4 person) but we try to accommodate friendship groups to the best we can! If you wish to have your own private room this will come at an additional cost. The tour will include full board! This means there will be three meals served everyday (Breakfast, Lunch and Dinner). We aim to deliver an experience when it comes to food. We want you to try as much local food as possible. You will try vegetables and fruit that you didn’t even know exist! Breakfast will either be continental consisting of eggs, toast, jam served with tea/coffee or sometimes even Sri Lankan breakfast! Yes, you’ve guessed it, curry! Either way, we will make sure your morning gets off to a good start. Lunch will usually be served en route to a new destination stopping off at various tea houses and local restaurants along the way. This is a great opportunity to taste food that is famous in that region. This is a great way to understand the culture and even strike up a conversation with the locals! Dinner will be traditional Sri Lankan cuisine. Chicken or fish is served often accompanied by noodles and rice. After a long day exploring your dinner will be served in your accommodation. This is a great chance to catch up with your group. If you wish to have a beverage, unfortunately, that will be on you! We take food requirements & allergens seriously at Travelteer. Please inform Travelteer management when confirming your date whether you have any requirements. For all vegetarians/vegans there is always a delicious veggie options available! The Travelteer bus (Yes! We have our own bus) can carry up to 22 people on each tour! 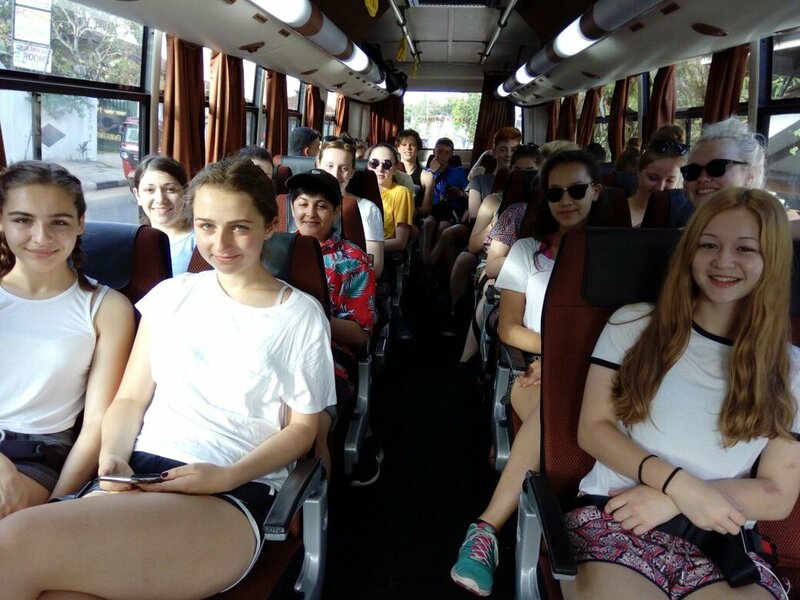 Our bus is air conditioned and we like to think it’s top of the range when it comes to transport in Sri Lanka. This will be your abode whilst on the road and will take you to each destination. 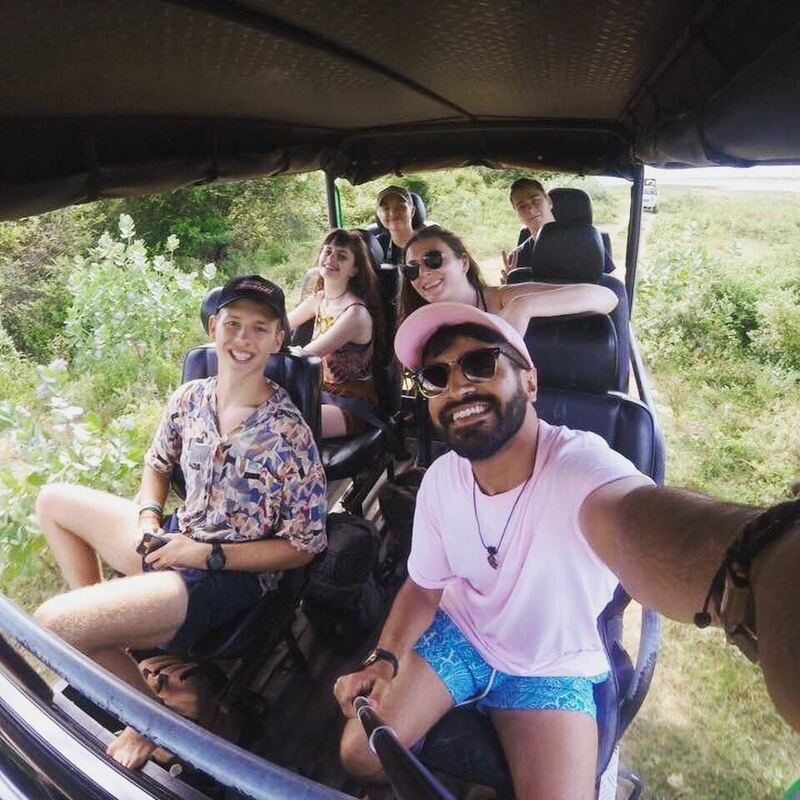 From the safari to surf boards - we cover all your activity and entrance fees for everything listed on your tour! One of our UK coordinators will meet you upon arrival. Look out for our staff wearing Travelteer t-shirts and sign! Once collected we will take you to your accommodation to meet other volunteers. You will be guided throughout the whole of your adventure by our tour assistant, Kalum. He will be with you every step of the way making sure you don’t miss anything and more importantly, you get back in one piece! Yes we will be there! Our team are always with you. Whether you’re lucky enough to have a UK staff member on your tour depends. However, our UK team always have presence in Sri Lanka. We know everything there is too see, that way you’re guaranteed you won’t miss out! Sri Lanka is our home. We know this place! That’s why we can quickly make you accustomed to Sri Lankan way of life. You will be catching a local tuk tuk in no time! 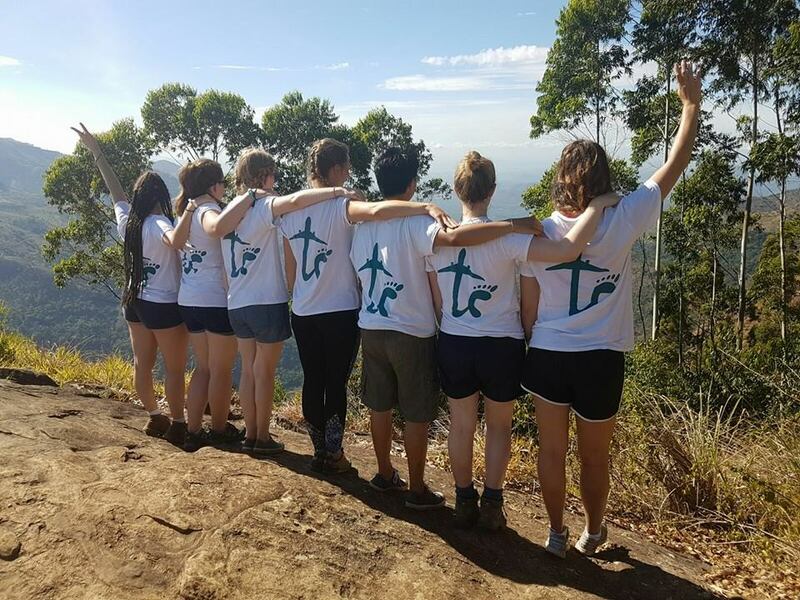 During January & February we get a lot of volunteers who are doing gap years, career breaks or placements as a part of their university courses. We also attract the largest amount of non-UK volunteers during this time. 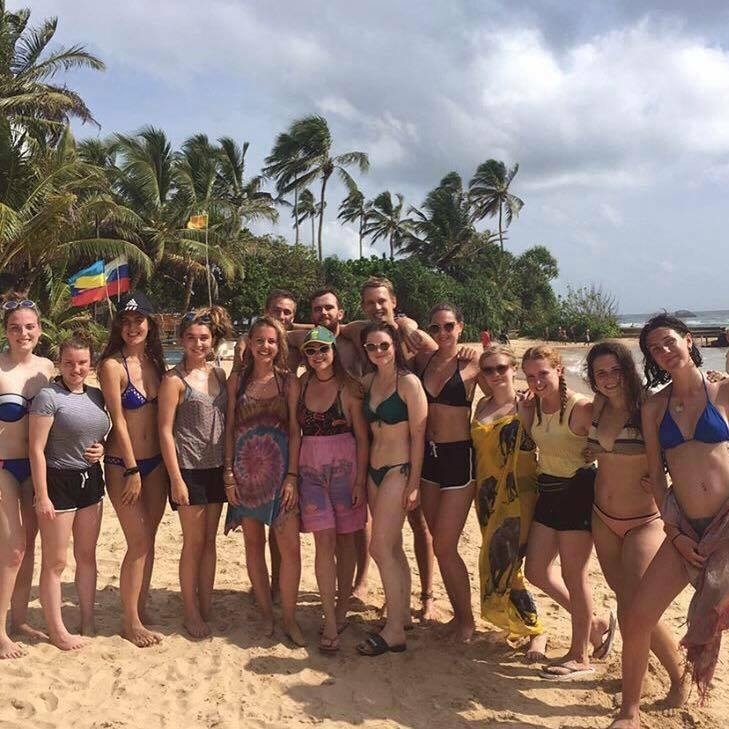 At Easter time we attract a similar crowd to the New Year - lots of University students who are using us as placements, but also people who are looking for short 2/3 week breaks during the Easter holidays.